Two years following its first expansion pack debut, LiveTypeCentral reenters the fray with the release of three new collections of design elements, canned animations, text treatments, objects, textures, and templates for version 2 of LiveType The company's LiveType Expansion Packs consist of individual DVDs packed with hundreds of design elements of every shape, size, and effect. Pricing is $299.00 for the complete three DVD set, or $149.00 for single expansion packs. The design elements are diverse, versatile, and professionally authored. 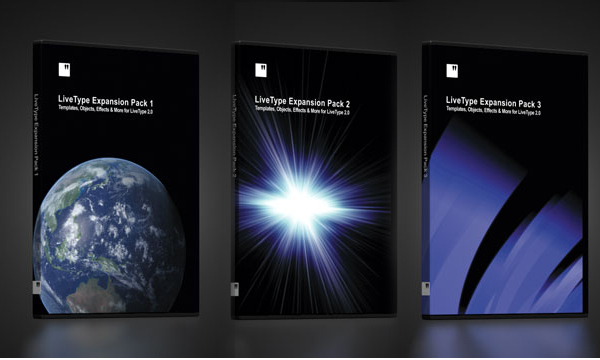 The expansion packs require version 2 of LiveType. Each set consists of various effects, objects, textures, templates, and a series of LiveFonts. All design elements are standard definition, although many objects, and LiveFonts scale well to various high definition project settings. LiveType Central offers a series of HD backdrops complete with matching static thirds and animated mattes at its companion 12inchdesign company web site. These backdrops are also available in single and multiple pack versions. As stated earlier, many elements can be scaled to high definition proportions to produce content for DVCProHD, and HDV projects for video or DVD. Not all scale as well as others, but when scaled the result can be impressive, if not a little bit, whimsical. However, this is just a bonus capability of the packs. 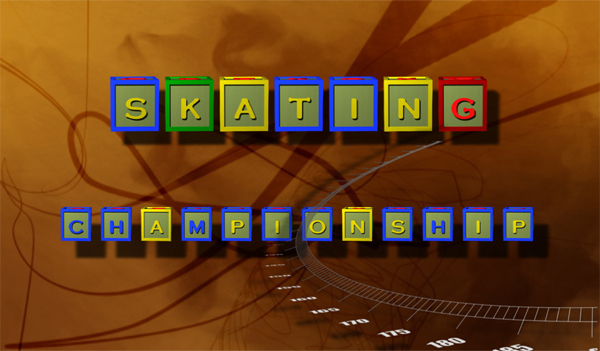 The design elements, templates, and other items are authored for use in standard definition. As such, they incorporate seamlessly with the stock Apple elements included with LiveType 2.0. There isn't enough space in this review to detail each of the supplied elements. However, the company's web site provides previews of each of the components. Note that the Flash 8 player browser plug-in is required to view the previews. 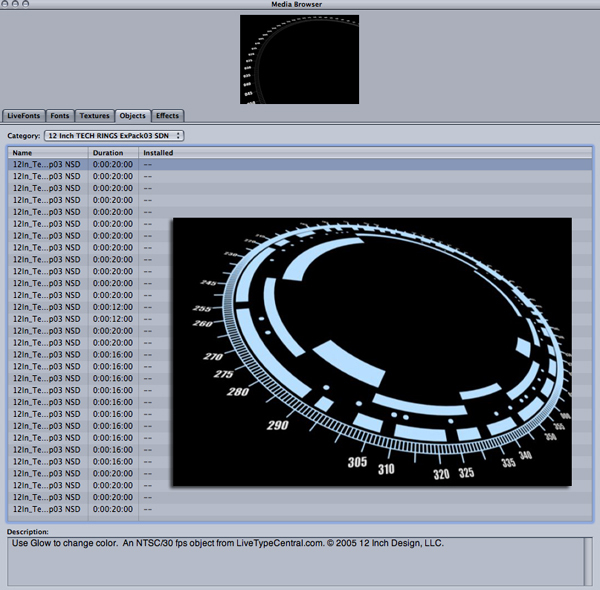 Dozens of static and animated or motion elements are provided. Most elements are markedly different than the stock LiveType library. Categories run the full spectrum from earth rotations and flares to clocks, gears, circles, pointers, stars, pulses, animated shapes, lightning, swooshes, spins, and more. There is even an animated thoughtbubble, and over 30 examples of animated technical rings. 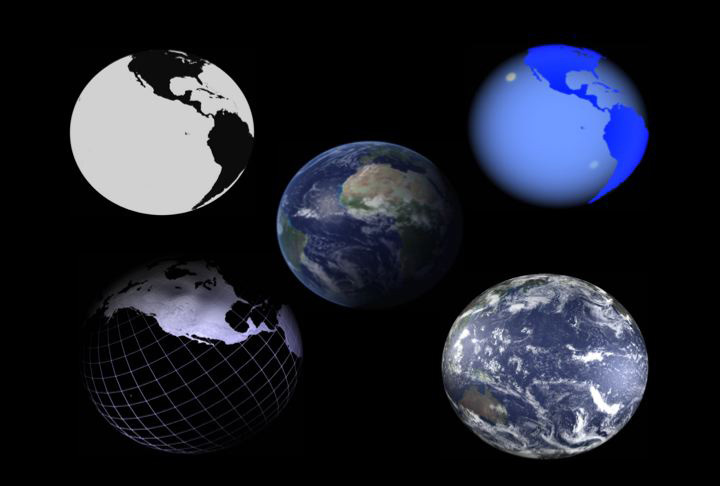 Included as well are some very elegant 3d appearing earth rotations, and at least one zoom rotation. Pack 1 is representative of what is contained in the various packs. It consists of 30 text effects, 125 objects, 30 textures, 35 templates and 10 LiveFonts. Installation consists of mounting the DVD, and using the supplied installer. Once downloaded to your local volume, use the LiveType preferences pane to link to the design elements. The install is a hefty 11.65 gigabytes for all three DVDs. The packs include lower thirds, animated titling, text effects, static and animated mattes and shapes, and a series of very dramatic transitions. Included as well are a set of animated "years" that fly in and out of the stage that include dates up to 2012. Three distinctive animations for each year are provided; again, a testimony to how detailed these sets are. There are twirly lines, animated mattes, flares, flowing colored fabrics similar in appearance to DVD SP themes, lines, grow bars, pulses, a distinctive flag animation, fabrics, paper, dozens of borders, and a very charming wipe on of a chalk board. The animated textures are diverse and colorful. If you have the time, and the poetic license, there are endless varieties of effects that can be produced with these design elements. Each DVD pack included about thirty text animations, and 35 to 40 templates in NTSC SD format. Some templates have corresponding design elements that mesh well, and others are as simple as reflections. As with any set of canned animations and elements, eventual output is limited only by the user's creative capabilities and artistic license. These packages are excellent start points, and in many cases, can be used as is, or amended with LiveType's various controls. Again, the price point of these packages is excellent. David A. Saraceno is a motion graphics artist located in Spokane, Washington. He has written for DV Magazine, AV Video, MacHome Journal, and several state and national legal technology magazines. David also moderates several forums on 2-pop.com.